The Dauner Martin Nature Sanctuary doesn’t feature towering dunes, cold-water trout streams or a golden beach along Lake Michigan. 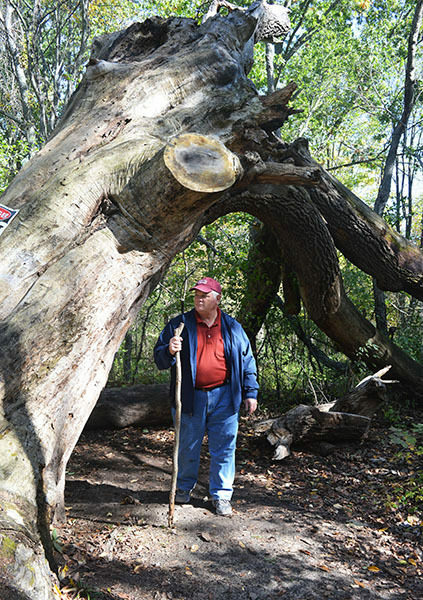 But it’s still one of Michigan Nature Association’s most popular preserves for a reason all real estate agents will appreciate; location, location, location. 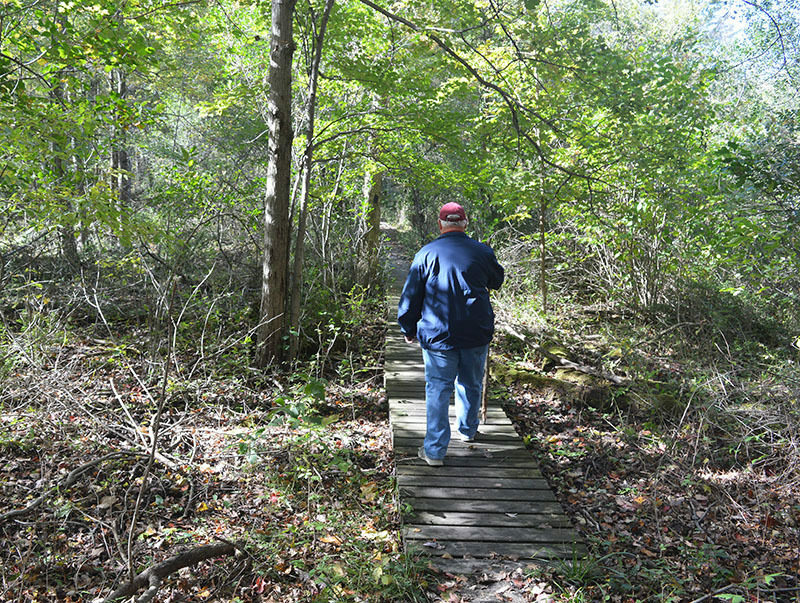 The 155-acre sanctuary and its 4.5 miles of foot paths is located within the city limits of Fenton. For those who live in and around this Genesse County town of almost 12,000 residents, Dauner Martin is a quick escape into the woods for a little trail running, to soak up fall colors or enjoy the first wildflowers of spring after a long dreary winter. The Dauner Martin Nature Sanctuary doesn’t feature towering dunes, cold-water trout streams or a golden beach along Lake Michigan. But it’s still one of Michigan Nature Association’s most popular preserves for a reason all real estate agents will appreciate; location, location, location. 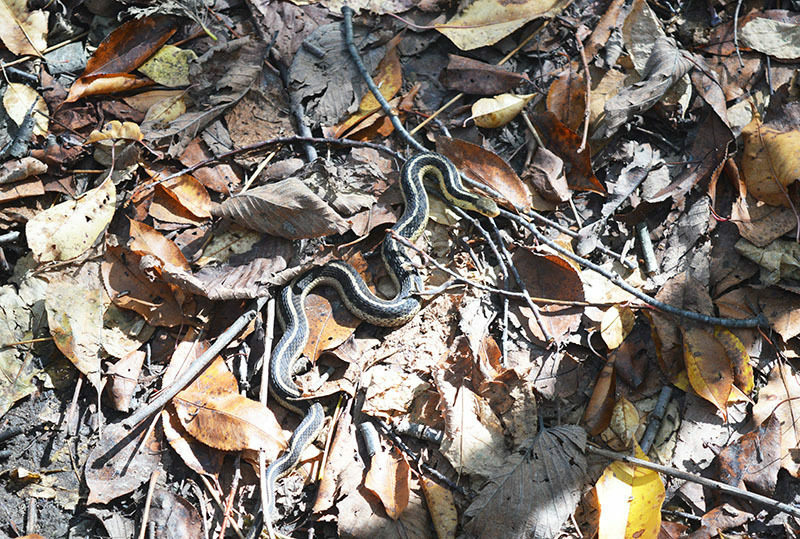 The 155-acre sanctuary and its 4.5 miles of foot paths is located within the city limits of Fenton. For those who live in and around this Genesse County town of almost 12,000 residents, Dauner Martin is a quick escape into the woods for a little trail running, to soak up fall colors or enjoy the first wildflowers of spring after a long dreary winter. The tract dates back to 1863 when Phillip Dauner purchased the land to grow hops for his brewery in Fenton. Eventually his great grandchildren, Robert Dauner and Marion Martin, inherited the property and it was Robert who spent years planting pines in an effort to restore the natural habitat of the area. The Dauner family donated the 155 acres to the MNA in 1998 and today the sanctuary consists of large pine groves interwoven among stands of hardwoods that make Dauner Martin a forested haven. Among the 40 native tree species four here are elm, ash, cherry trees and some very large oaks. In the beginning the trails were marked with a variety of signage and names, making them hard to follow at times. But beginning in 2010, the system was updated with color-coded posts that corresponded with diamond-shaped, plastic blazes nailed to trees. In 2017, a $14,000 grant allowed MNA to make even more improvements to the sanctuary including new trailhead information displays, upgrades to the parking areas and the removal of invasive species. The trail system consists of four main paths. The longest is the 1.7-mile Blue Trail that begins at the Leroy Road trailhead and winds around the northern and eastern side of the sanctuary to the Dauner Road trailhead. The Yellow Trail is a 1.2-mile loop from Leroy Road and the Green Trail is a mile-long loop starting near the Dauner Road trailhead. The Purple Trail is actually two separate trail segments totaling a little over a half mile. The hike described here is the perimeter of the system that begins at the Leroy Road trailhead and makes for a 2.5-mile outing in which only one house is seen from the trail. It’s indeed an amazing escape from the rest of Fenton. Dauner Martin has very little open water but there are scattered forested wetlands. The wettest areas have been bridged or planked but you still have to think twice about doing this hike in early spring. From the Leroy Road trailhead you enter a young woods and stay right at the first two junctions to remain on the Blue Trail. For the first half mile the scenery is predominately pine plantations and at times it’s tough to see the actually trail among the nearly perfect rows of trees. Keep an eye out for the blue diamonds. A bench is past in a third of a mile and at Mile 0.6 you leave the pines for a more natural hardwood forest and arrive at the junction with the Green Trail. Stay with the blue blazes (left) and after passing a junction with the Purple Trail, you begin hiking pass some rather large oaks that are stunning in the fall. The largest is seen just before Mile 1. Within a half mile the trail passes under a huge fallen oak to arrive the south end of the Purple Trail. Stay left and at Mile 1.5 you arrive at where four trails converge. The Blue Trail swings to the south here to reach Dauner Road in less than 300 yards. Heading north is the Green Trail, both the east and west side of the loop. Follow the west side and in less than a third of a mile you reach the Yellow Trail where you head left and then left again at the next junction. This segment of the Yellow Trail heads due south, reaching a junction with the other half of the Purple Trail at Mile 2.1 and just beyond it a bench overlooking an open wetland meadow. It’s a pleasant spot and where you want to sit quietly at dusk for an opportunity to spot a deer or two. The Yellow Trail swings to the west at this point and reaches the Leroy Road Trailhead at Mile 2.5, using a long bridge and a boardwalk along the way to stay out of the wettest areas. There are no facilities at the Leroy Road trailhead other than limited parking and an information display board. Dauner Martin Nature Sanctuary is open year-round from dawn to dusk. There are no entrance or vehicle fees. Dauner Martin Nature Sanctuary is located in Genessee County, between Leroy and Dauner Roads. From US-23, depart at the Silver Lake Road and head east to downtown Fenton. In 1.5 miles head north on North Leroy Road and the trailhead, located at the end of a short entrance road, will be reached in 1.2 miles. It’s easy to miss but is located between Guns Galore Gun Shop and VG’s Grocery. The other trailhead is on Dauner Road 0.4 miles east of North Leroy Road. 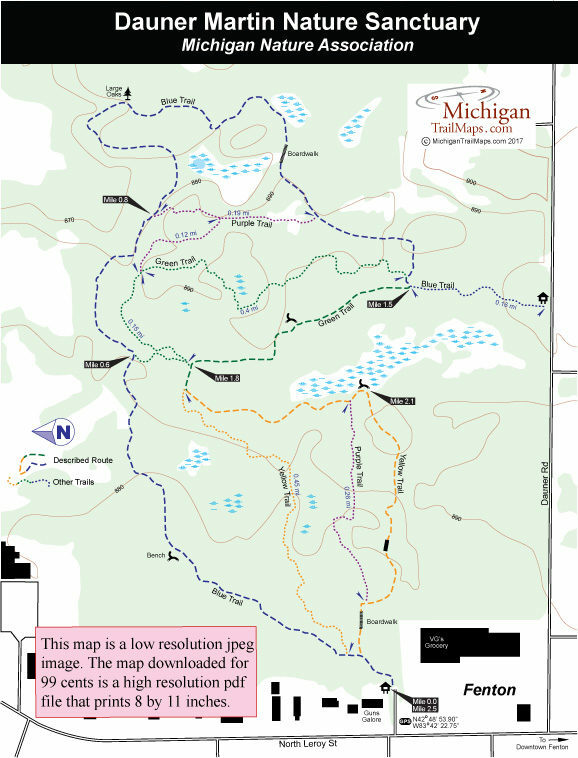 For additional information, contact the Michigan Nature Association at (866) 223-2231.